Students must have completed their freshman year of high school by June 2019. Enrollment in the Institute is limited to 20 students per class, and so we encourage early applications. Scholarships: There are a limited number of tuition-only scholarships which will be awarded on the basis of financial need. To apply, select Schwanke Honors Institute Scholarship Application. Presidential Leadership Scholarship semi-finalists may apply for these need-based scholarships and will also be granted a $500 scholarship. The application requires students' unofficial high school transcript. Be sure to have this document in either PDF or Word format so that it will be ready for uploading. In 500 words or less, students need to describe their interest in participating in the Schwanke Honors Institute. Please be specific in the relevant experiences you have had, what you are interested in learning, and why you would like to participate in this Institute. You should prepare the statement in Word and then be ready to copy and paste the statement into the application below. Before beginning the application, please scroll down to review it first to ensure you have all of the other required information. You will not be able to edit the application once you have submitted it. The priority registration deadline is April 30, 2019. Students will be notified on a rolling basis if they have been accepted into the Institute. If not U.S., are you a permanent resident alien of the U.S.? Has student previously attended the University of Montana? Is student a participant in the GEAR UP Program? Has student ever been convicted of a felony? Has student been otherwise institutionalized for threatening or causing physical or emotional injury to persons or property? Has student ever been dismissed and/or suspended from a college for disciplinary reasons? Does student have a disability and need an accommodation to participate in this Institute? Students will be enrolled in one course only. Each course has a maximum enrollment of 20. Indicate the student's first choice by entering the number 1 and second choice by entering the number 2. 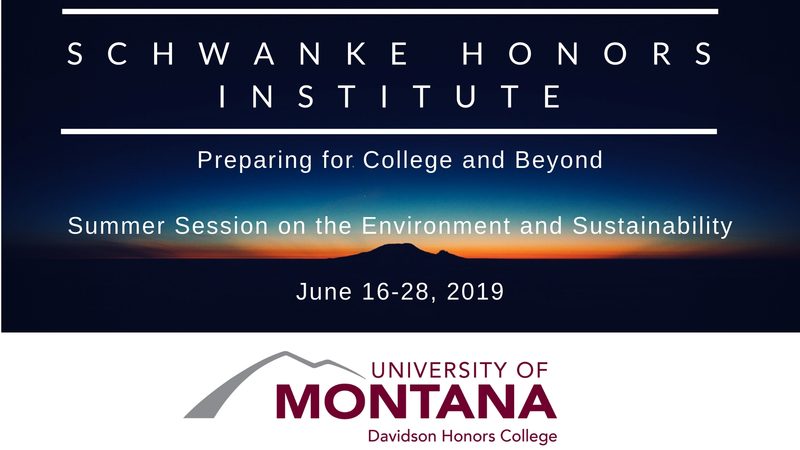 Do you plan to attend the University of Montana in Fall 2019? Enter yes, no or undecided. Please let us know if you plan to apply for a needs-based scholarship. Scholarship requests must be received the same day as the application. Applications will be reviewed and students notified within 7-10 days of submission. Click here for the Schwanke Scholarship Application. Make sure to complete your application first before submitting a Scholarship request! Yes, we are submitting a scholarship application. No, we are not submitting a scholarship application. * The following information is voluntary. How did student learn about the University of Montana? Select answer from the following: Counselor; Web research; High school visitation from a UM representative; Visit to UM; Mass media; or UM brochures. Does either parent/guardian with whom the student resides have a bachelor's degree? Did either parent/guardian attend the University of Montana? Did either grandparent attend the University of Montana? Upload high school transcript (pdf or Word format). In 500 words or less, please describe your interest in participating in the Schwanke Honors Institute. Please be specific in the relevant experiences you have had, what you are interested in learning, and why you would like to participate in this institute. You should prepare the statement in Word first and then copy and paste it into the box below. By entering my complete legal name below, I hereby certify that to the best of my knowledge the foregoing information is true and complete without evasion or misrepresentation. I understand that if it is later found otherwise, it is sufficient cause for rejection or dismissal. If my application for admission is approved, I agree to abide by the present and future rules and regulations, both academic and nonacademic, and the scholastic standards of the University of Montana, its colleges, schools, departments and institutes, including but not limited to those rules, regulations and standards stated in both the undergraduate and graduate catalogs. I further acknowledge that if I fail to adhere to these regulations or meet these requirements, my registration may be cancelled.